CHICAGO – Watching a heavy metal band perform during daylight can be a little like watching a horror film with the lights on. The overall performance can sometimes lose a bit of its edge and intensity. Fortunately that was not the case when the main acts took the stage for the “Chicago Open Air” concert at Toyota Park in Bridgeview, Ill. First up in that daylight, on the cool and breezy Friday afternoon of July 14th, 2017 – the first night of the three-day event – was the legendary thrash metal performers Anthrax, followed by the Megadeth, and then in the evening by Rob Zombie and the iconic rockers KISS. Anthrax, led by Joey Belladonna’s passion and high velocity vocals, matched the fury from the zealous crowd. The band opened with “Caught in a Mosh,” and bookended their performance with “Indians.” In between, Scott Ian’s shredding guitar, and the band’s fevered pitch kept the crowd’s adrenaline pumping with heart stopping performances of “Got the Time,” “Antisocial,” “Parasite,” and more. They left the crowd begging for more with their brief-but-fan-favorite set list. I had hoped to hear more of their critically acclaimed, Grammy nominated album “Worship Music” and their latest masterpiece “For All Kings.” However, the happening was just beginning, and Anthrax needed to make room for the three giants that were about to take the stage. After 30 years, thrash metal icons Megadeth with frontman Dave Mustain still put on an incredible performance. Guitarist Kiko Loureiro, bassist Dave Ellefson and drummer Dirk Verbeuren reinforced Mustain as he sneered through the vocals. The crowd cheered enthusiastically for the lighting quick, furious and technical sonic playing. As the sun went down the devilish came out to play, starting with electronic horror rock king Rob Zombie. Everyday is Halloween for RZ, and his fans love dressing up and joining in on the fun. The Zombie-loving crowd that swayed and danced in unison to the music embraced the haunting, hypnotic rhythms. Everything about the performance was larger than life, and theatrically produced to entertain, scare and enthrall. RZ’s band donned vampire masks, makeup and ghoulish attire. Rob Zombie himself wore black leather with fringes as he pulsated and karate kicked across the stage. The performance began with “Dead City Radio and The New Gods of Supertown” followed by the crowd favorite “Superbeast.” During the hour-long set, Rob fittingly declared that he personally was inspired to become a performer by two groups – KISS and The Ramones. The band then broke into a cover of the Ramone’s “Blitzkrieg Bop,” and large portions of the crowd in front of the stage responded by breaking out into several impromptu mosh pits. Rob Zombie is almost unparalleled in the field of combining imagery, music and theatrics, and is a must see live performance. However, there is one band that does all three perhaps the best… and they were set to take the stage and close out the night. 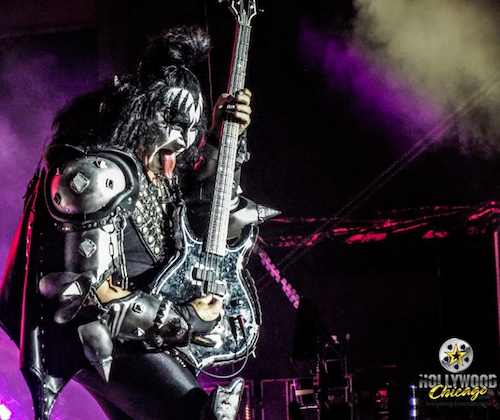 Gene Simmons dressed in his full Demon attire and towered over the crowd, spitting his characteristic fire and blood in every direction as he played bass. The Spaceman (formerly Ace Frehley, now Tommy Thayer) shot rockets from his guitar, and the Catman (formerly Peter Criss, now Eric Singer) played on a hydraulic drum riser. The audience was captivated by the onslaught of rock anthems combined with the visual assault on their senses. Chicago… you wanted the best, and you got the best. The “Chicago Open Air” concerts continue at Toyota Park in Bridgeview, Illinois, on Saturday and Sunday – July 15th and 16th, 2017. Click here for more details and ticket information.